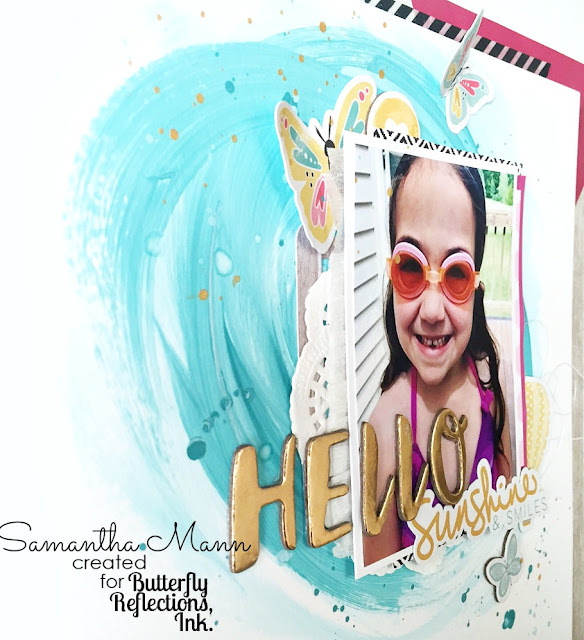 Samantha here, and today I'm sharing a layout of (pause for effect...) Vanessa's daughter!!! ha ha ha!! So here's the short story, that photo is just ADORABLE!! And when Vanessa posted it, I told her what a sweet photo it was and she jokingly asked me if I wanted to scrapbook it for her...so...YES!! And Vanessa, it's in the mail, coming your way! Ha! I started by using some Distress Paints in Peacock Feathers and Tumbled Glass! I just poured the colors onto the cardstock and used a paintbrush to make the large circle! Love it! This could also be done with any kind of watercolors you have, too! I layered behind the photo with a bunch of FUN papers from the Studio Calico Baxter and Basic Grey B Side 6x6 papers! I did lots of embellishing with the Fancy Pants Life is Beautiful Ephemera! Love those little guys! Ha! The title was created with the goooooorgeous Crush Gold Thickers from Pebbles! The title works for this page, but also...it's a throw back to our trip to CHA last year (I'm looking at your Vanessa, Danielle, Kim and Janette!! Ha!). I machine stitched the butterflies (butterflies, Vanessa!!!!) and some of the embellishing at the bottom of the layout! I also used a few puffy stickers to bring that gorgeous pink color down to the bottom cluster from the Millie and June collection at Fancy Pants!